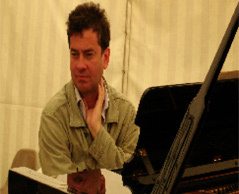 Vladimir Miller studied music at Trent Park University from 1981-4, during which time he experimented with contemporary theatre and performance arts projects and regularly performed the works of such composers as Kurt Weil. In 1987 he formed a modern jazz quartet playing his own compositions on the London jazz circuit whilst maintaining solo piano residencies over a period of three years. In 1990 he formed a composition partnership with singer / songwriter Heather Joyce and co-wrote music to an award-winning theatre production of Carousel’s ‘Smokescreen’, premiered at the Brighton Festival. Their music has also been performed throughout England, including festivals at Bath and London’s Soho. In 1992 Vladimir travelled to Eastern Europe to explore new musical possibilities. He instantly formed new musical associations with musicians and performance artists that have continued to endure. His collaborations with installation art group ‘Blah’ and musicians such as Vladimir Rizitsky (reeds), Vladimir Tarasov (drums), Vladislav Makarov (cello) and Alexander Alexandov (basson) have led him to festivals in Siberia (Novosibirsk and Irkutsk), Arkhangelsk, Nijzni Novogorod and Ekaterinbourg in Russia, Odessa and Kiev in the Ukraine, Lithuania and Latvia.